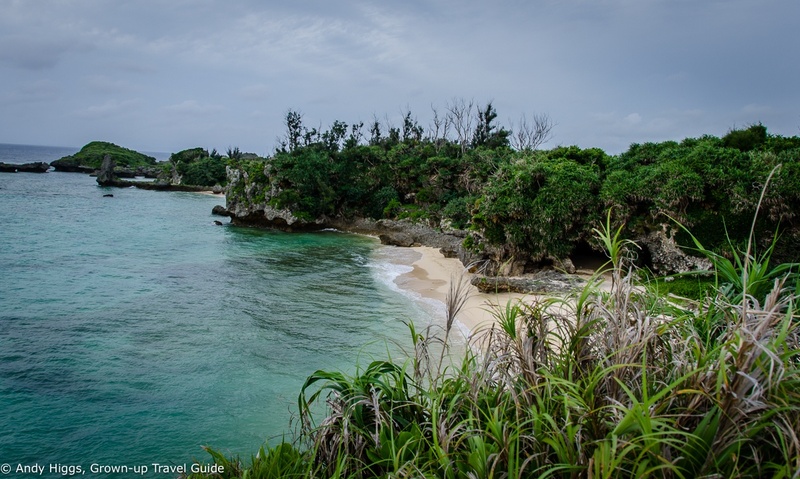 It’s not every day you get to discover the key to a long and healthy life, so you’ll understand that we were quite excited about what we would find in Ogimi Village located in the far north of the main island. 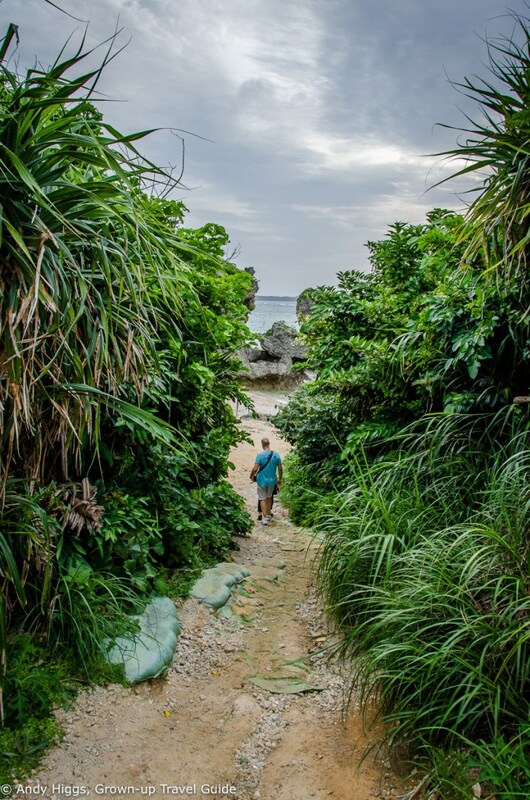 Ogimi has achieved global fame for a couple of reasons – several populations studies have shown Okinawa to be the place on Earth where people live longest and Ogimi is the epicentre of this phenomenon. 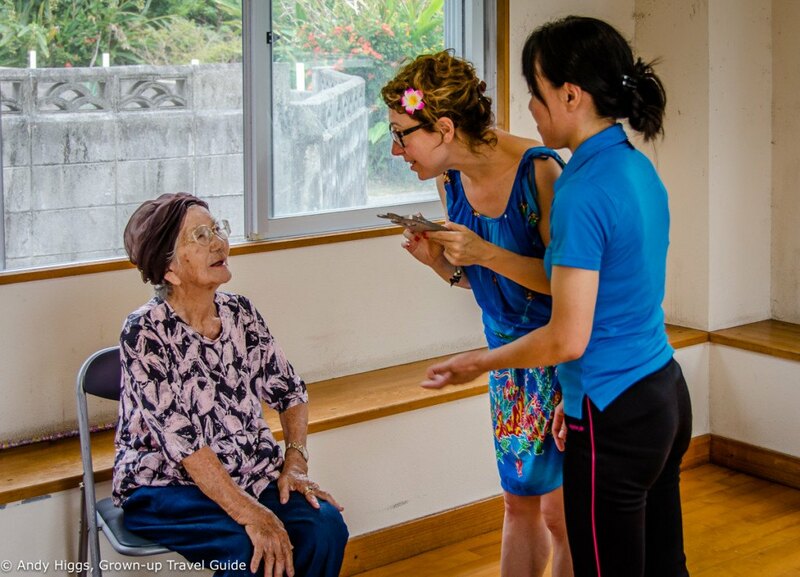 It has a record number of centenarians and attracts a steady flow of researchers and media folk looking to discover its secrets. 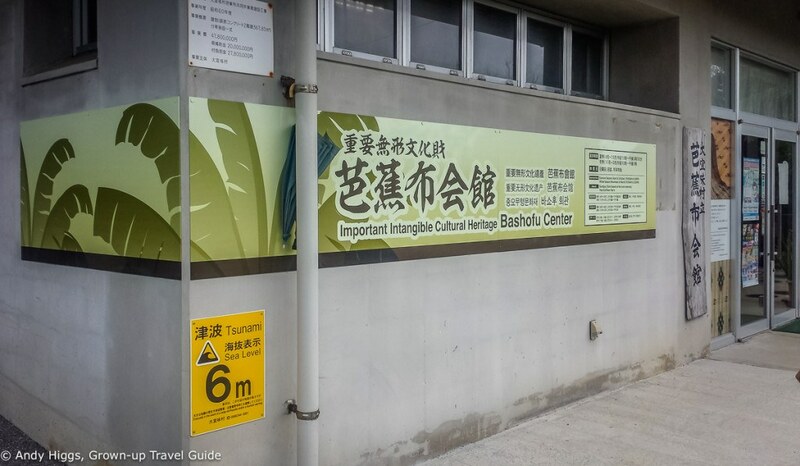 It took about an hour to reach the place, a small town of around 3000 people which looks much like any other rural Okinawan settlement. 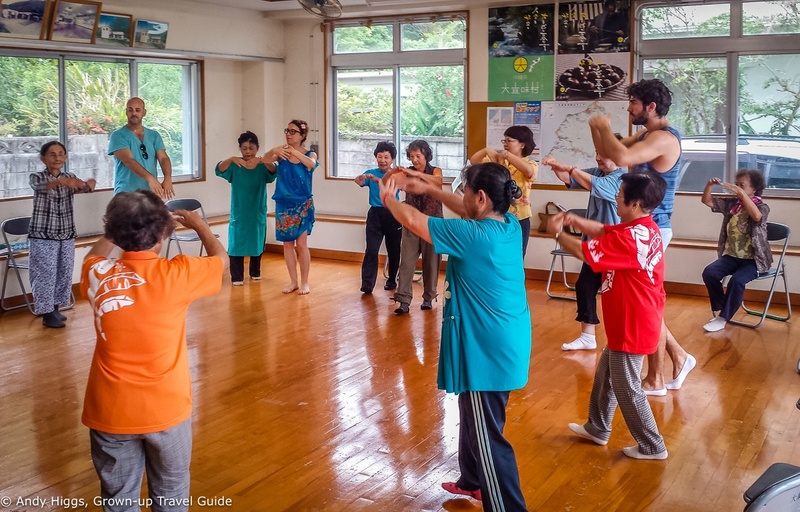 We arrived at the community centre where we would join a group of sprightly locals for their exercise class before chatting to them afterwards. The first thing that struck me was that the hall was devoid of men – as indeed the village itself appeared to be. 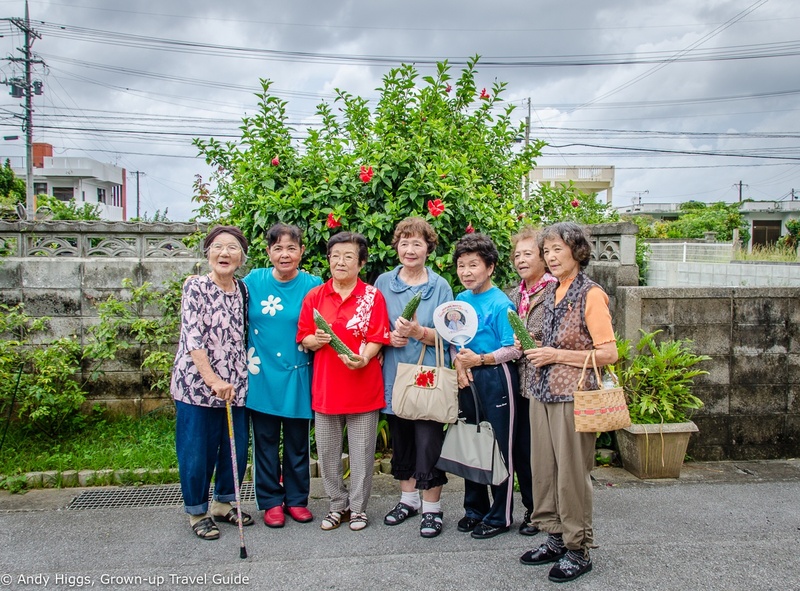 Longevity is clearly a feminine trait – I began to realise that there may be little hope for me personally to reach the same age as these ladies. 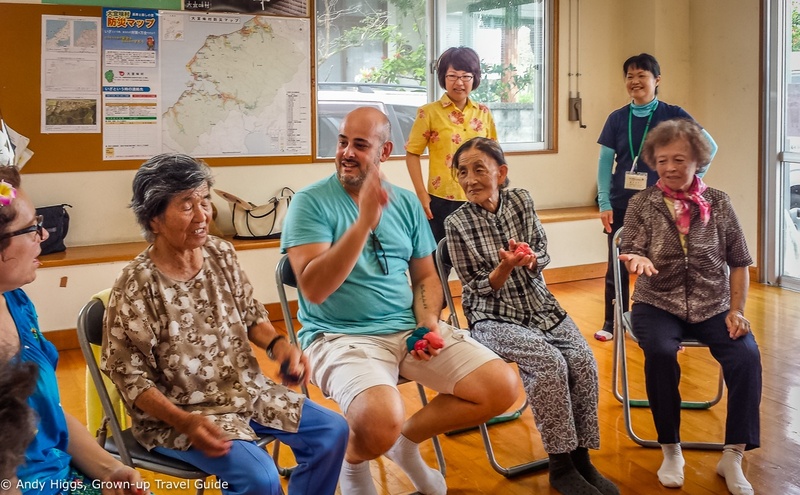 A brief introduction revealed that the majority of the group were 75 and above and rather distressingly had about twice the energy I have at 45. We sat in a circle and began a game which involved passing a ball round the ring and keeping a rhythm. Then it was time for some serious exercise and we followed the instructor in performing various stretches and steps. Naturally we couldn’t leave without dancing, so we made idiots of ourselves pairing up with infinitely more nimble and graceful partners twice our age. Suitably humiliated and relieved it was over, we then posed for photos. Next we got a chance to talk with some of the group with the instructor helping out as an interpreter. This picture isn’t actually representative of this since Stefania speaks fluent Japanese and had no problem talking with her interview subjects. But otherwise it illustrates what we got up to. It turns out that there are a number of factors that the ladies believe make them live so long and so well – there’s not much point in living an extra ten years if that decade is spent lying in bed, after all. Diet plays a big part and ‘Goya’, or bitter gourd is magic ingredient number one. This green vegetable resembles a cross between a courgette and a cucumber with a bumpy surface and is what three of the ladies in the photograph are clutching. The bitter taste takes some getting used to (although I liked it) but there is no doubt that the plant is extremely high in nutrients. With vitamins B6, B12 and C as well as antioxidants and folate, it’s easy to see why locals include goya in as many meals as possible. 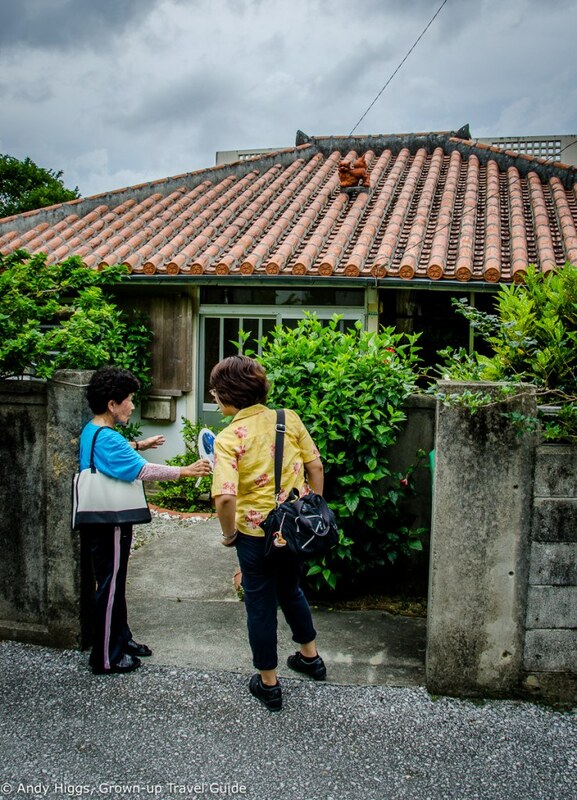 One of the ladies, Kikue Okushima, was kind enough to agree to an interview at her house, so we followed here down the road to her abode. 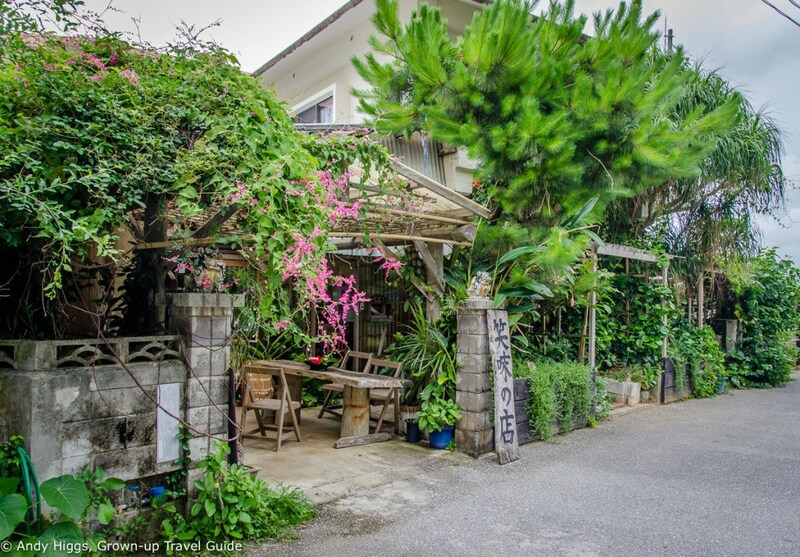 A simple yet elegant bungalow decorated with memorabilia and artwork, the place was very comfortable and inviting. Our subject wanted to change so we waited for her to re-emerge in a robe and the interview began. 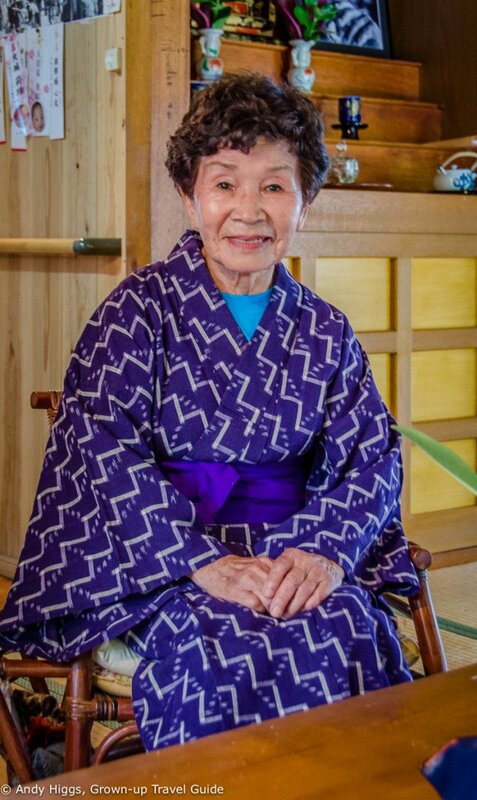 Kikue Okushima told us the secret of longevity, which I am keeping to myself. No, I’m just kidding. 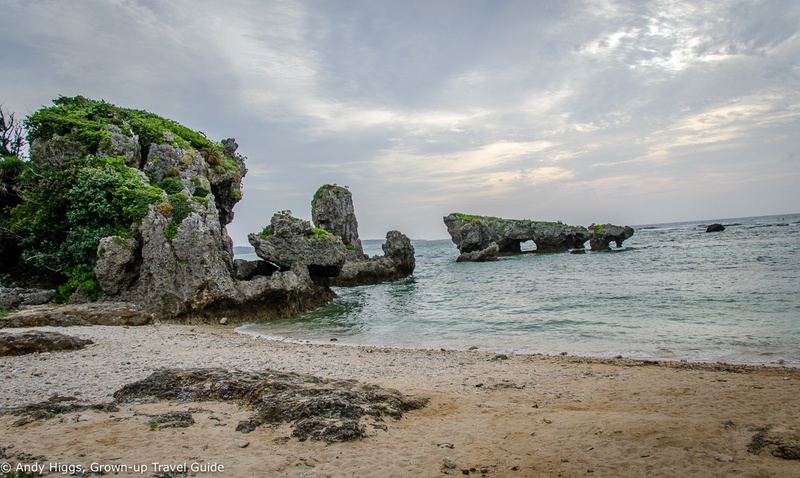 As previously mentioned there are a number of factors – the Okinawan climate is a healthy one; a diet of rice, plenty of vegetables, sea vegetables (especially seaweed) as well as tofu and a small amount of meat also plays a huge part. As well as goya, another wonderfood from Ogimi is a citrus fruit called Shiquasa. The fruit looks like a lime and contains remarkable quantities of citric acid, nobiletin, vitamin C, vitamin B1, carotene and many minerals. 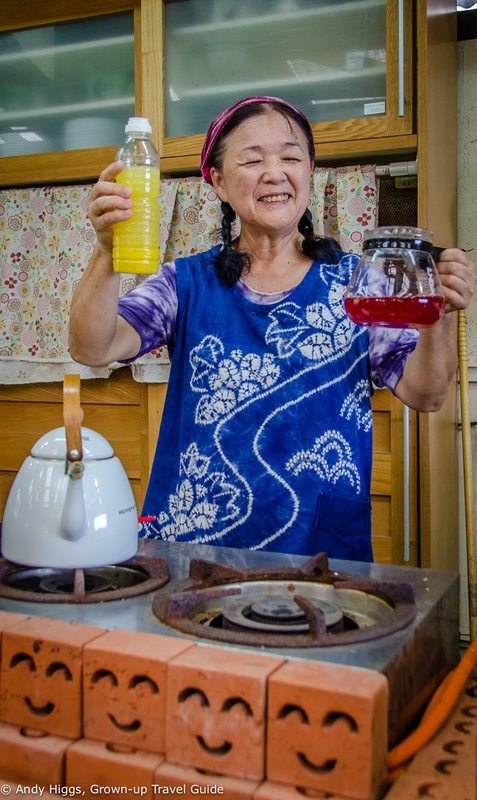 Nobiletin is said to prevent cancer and locals recommend adding shiquasa juice to everything. 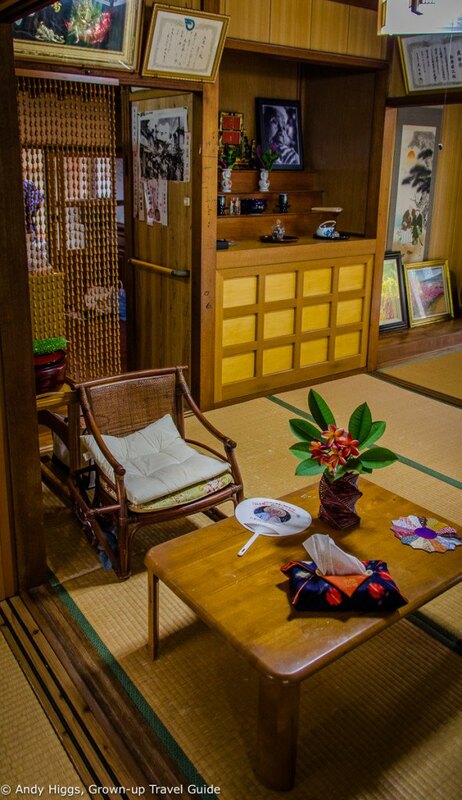 Yet perhaps more than any other factor she believes that socialising is the reason they live so long in Ogimi. Being part of a strong social network of friends and spending time with one another on a regular basis is essential – and I think she’s right. Unfortunately in our ‘modern’ world we are becoming ever more isolated and moving in the opposite direction. Music and dance are also vital, she believes – no argument about that from me. And the reason why men don’t last? Well some do, but the majority of men don’t have the social life in older age, preferring to stay indoors alone. No kind of healthy diet can cure isolation and loneliness – so there’s a lesson here for us all. 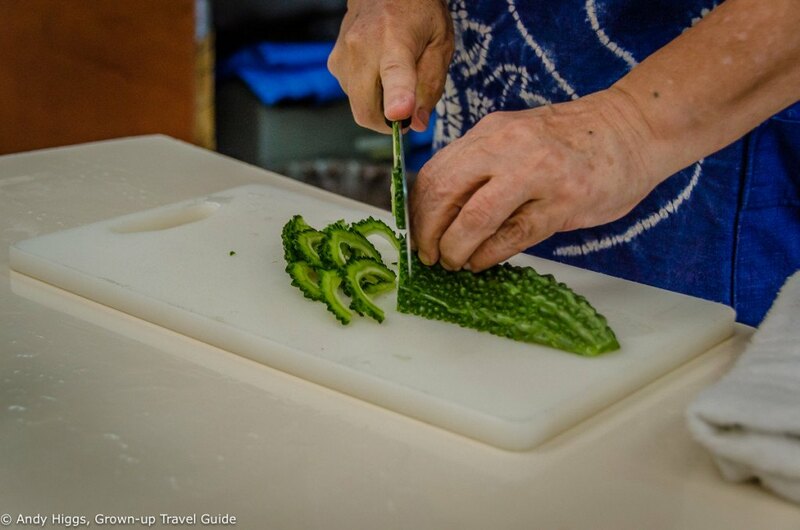 Having learned so much about the importance of food in the Ogimi lifestyle it was time to learn how to prepare it. Just round the corner is a cafe with a great reputation and cookery classes next door. 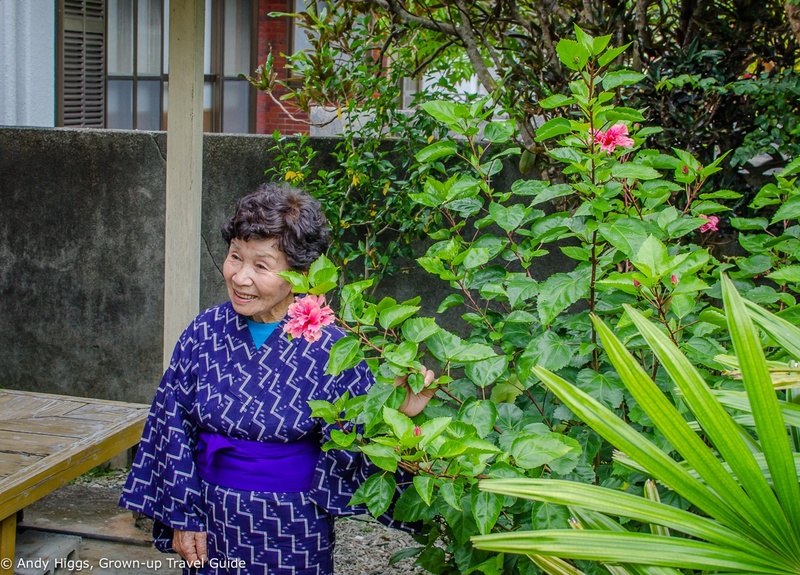 Our teacher was the renowned local chef Emiko Kinjo. It’s very nice too, both refreshing and extremely good for you. Next on the menu was Goya no Tamago Toji or goya mixed with fried egg. First the goya needs to be sliced as shown above. 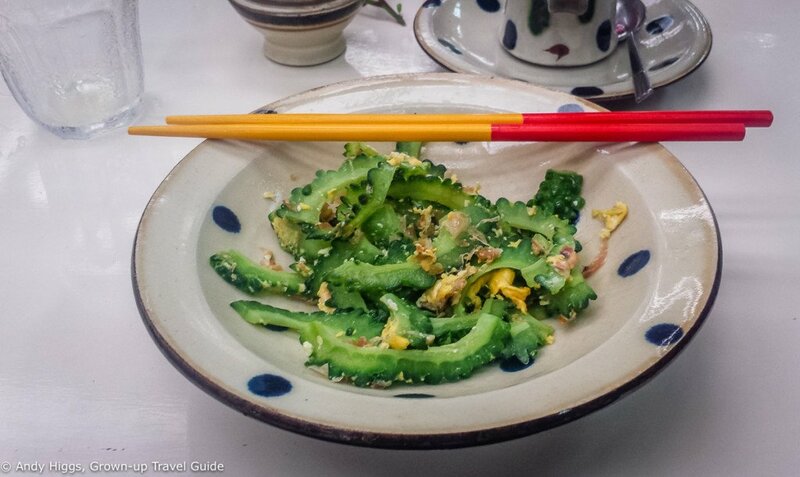 Goya and egg are stir-fried in a wok to produce this light dish in which the egg flavour compensates for the bitter taste of the goya. Scrumptious! 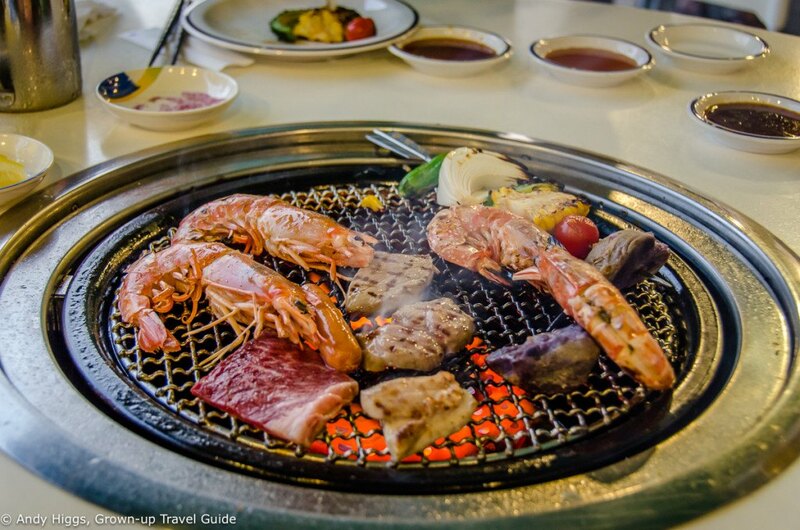 By now we’d worked up quite an appetite which was good since lunch awaited us next door. 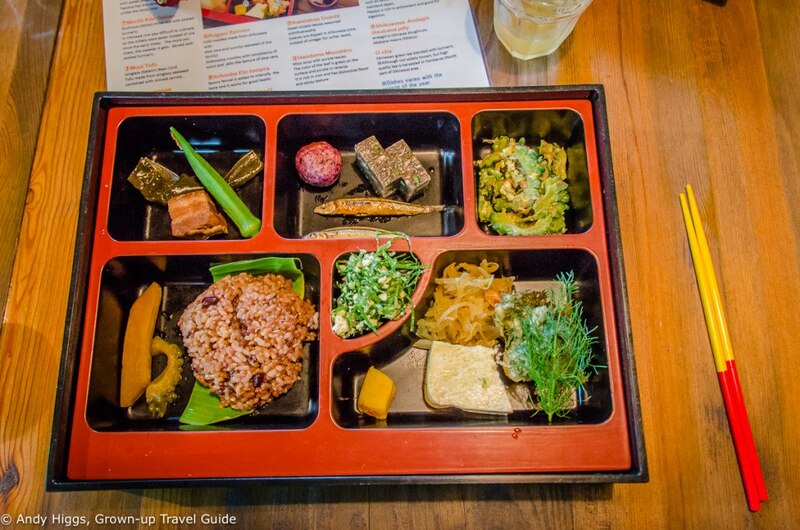 As usual both the food and the presentation were superb with all dishes served in this ‘lunch box’. 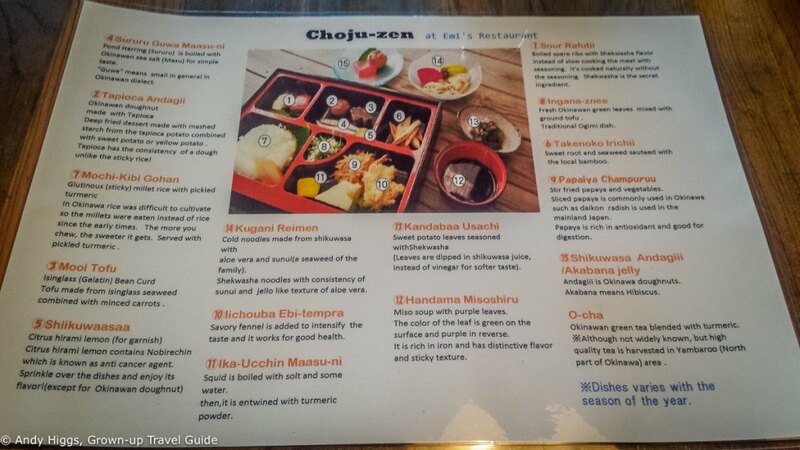 Handily an English menu was provided with a key to each of the sections so everyone knew what they were getting. It will hardly come as a surprise that I finished the lot and loved it. If this is what is required to live until I’m 100, I’m in. 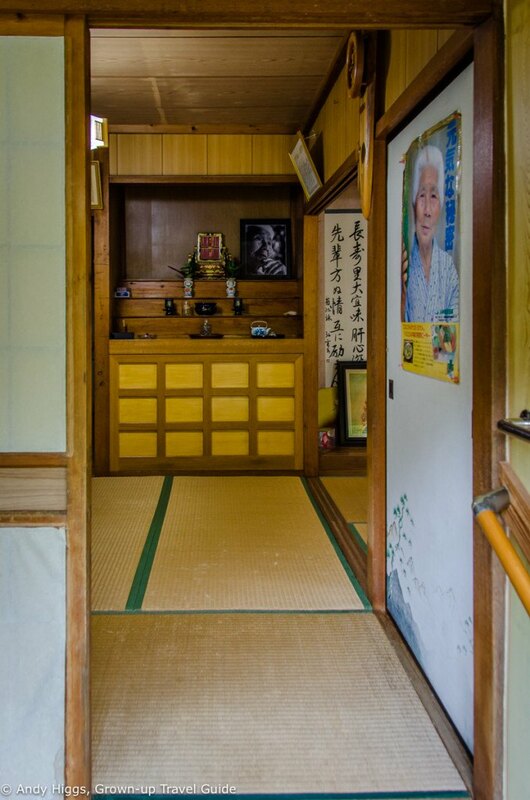 After lunch we returned to the bus and left Ogimi for our next destination – Kijoka. 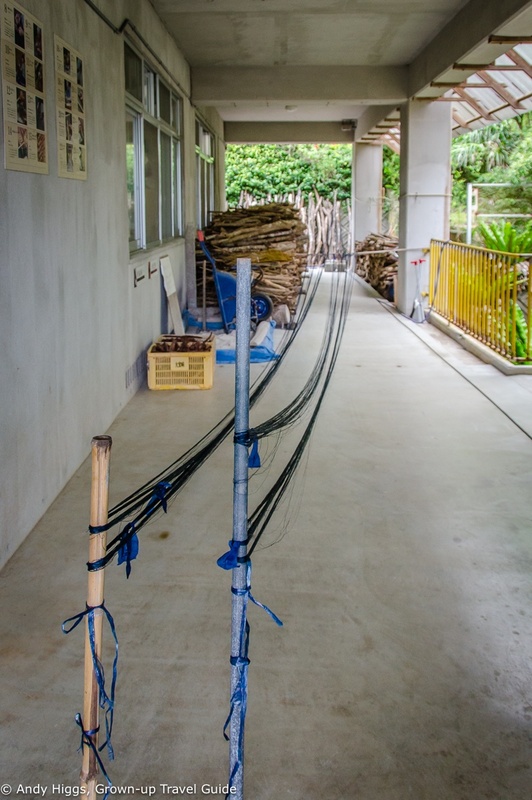 Our goal was the Kijoka Bashofu Center, a cooperative dedicated to preserving the traditional weaving method used in the production of banana-fiber kimonos. 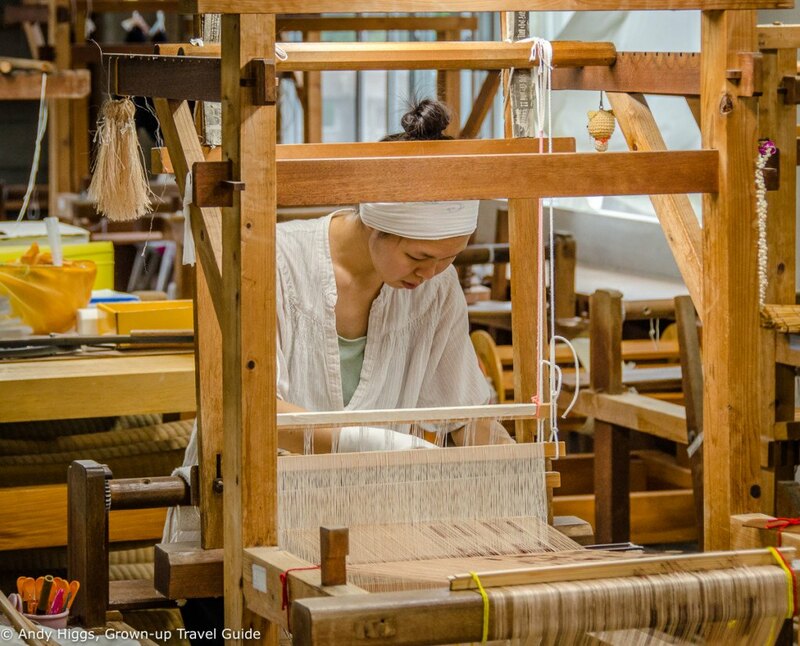 This craft is world-famous – especially since it was used by fashion designer Issey Miyake. 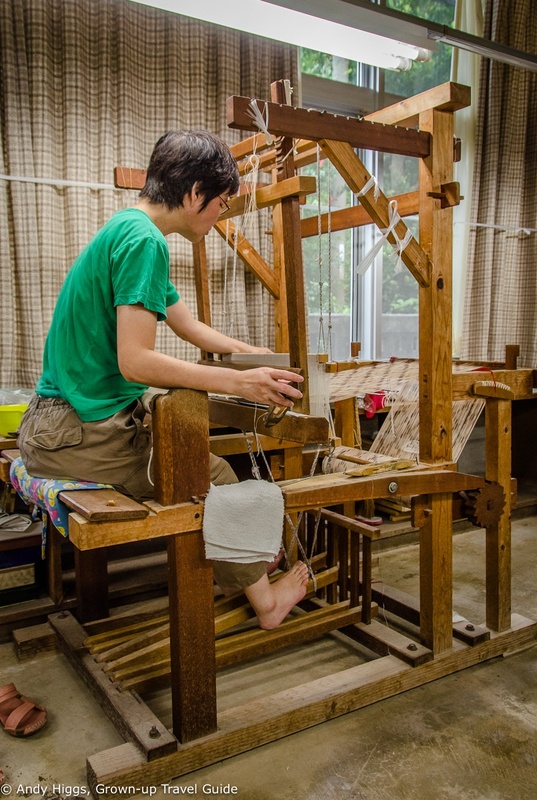 Yet it is an incredibly time-consuming and intricate process – and one that was nearly lost to Okinawa after the second world war. 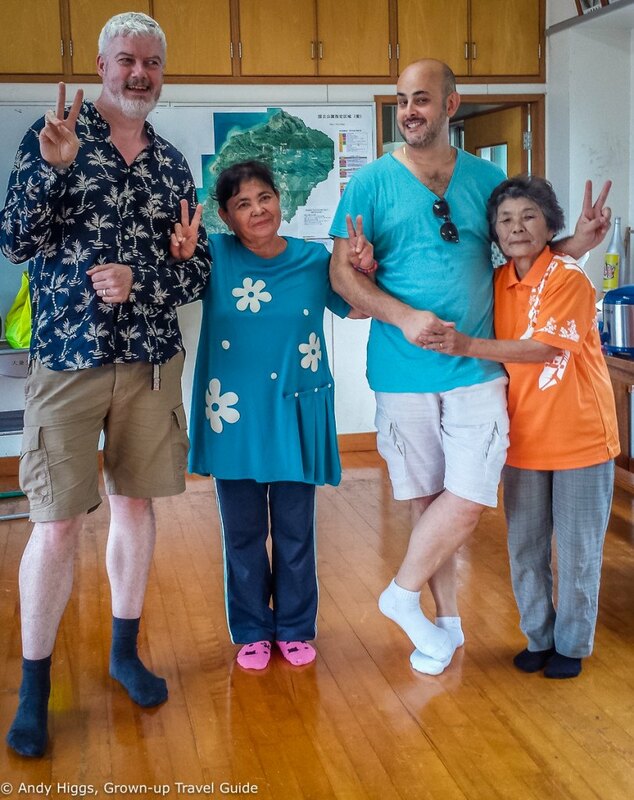 Fortunately a group of local women energetically led by Toshiko Taira refused to let this happen. 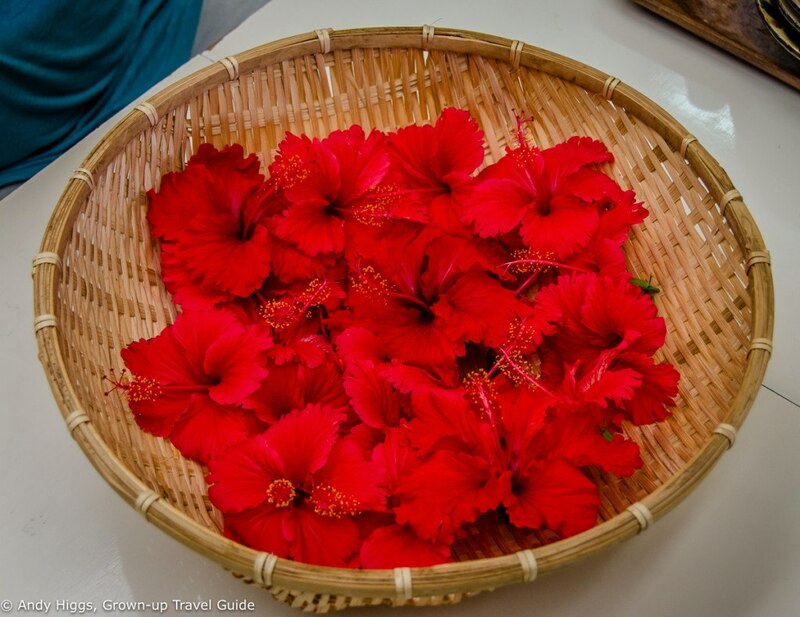 They worked together to continue the traditional practices and have passed on their skills to a new generation. 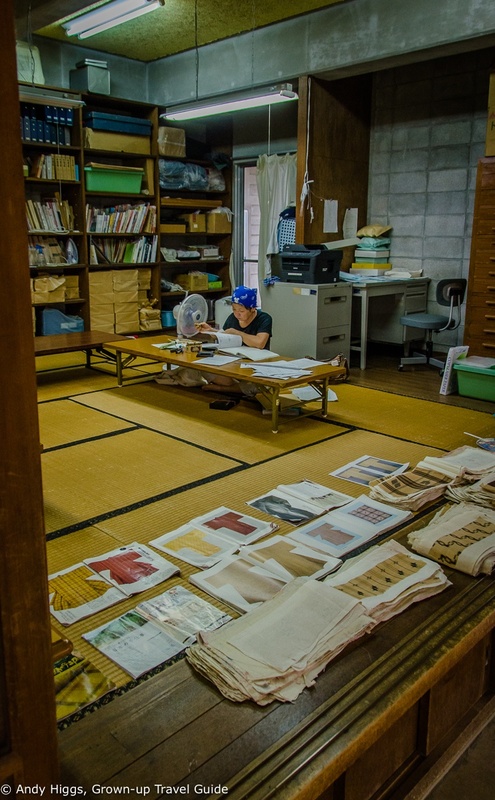 First of all we met with the current manager who showed us a very well-made video about making bashofu cloth. 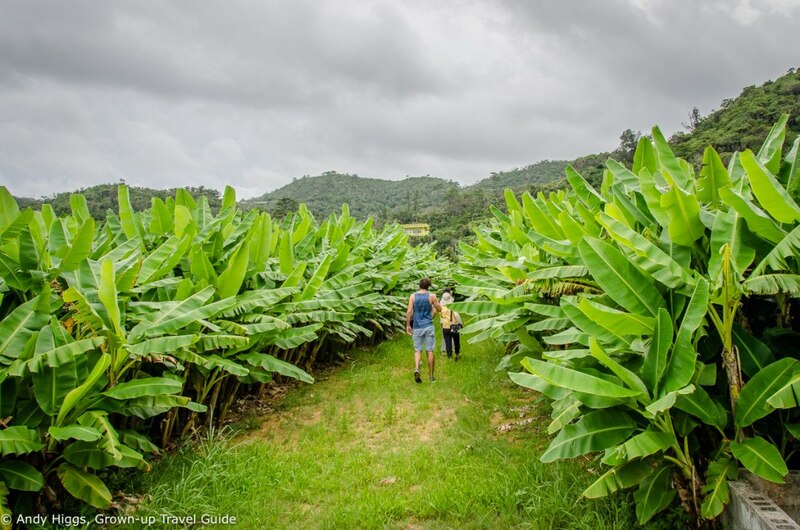 We then went outside to have a closer look at the banana trees in the plantations that surround the center. 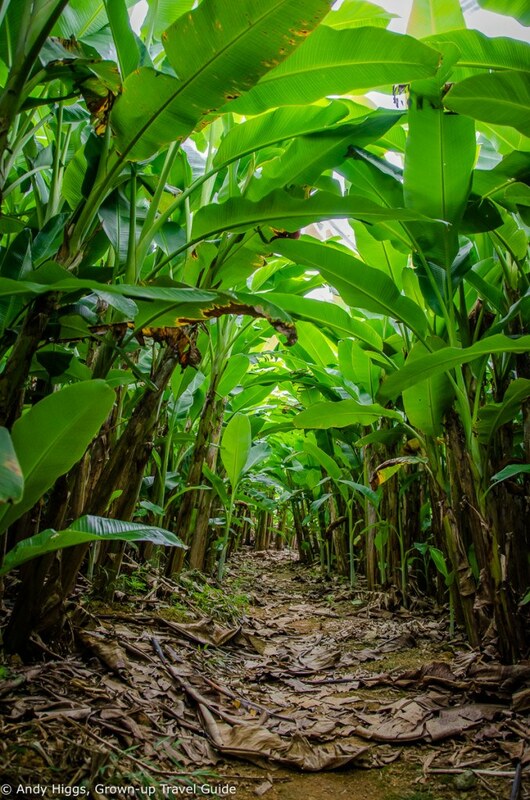 Walking through the plantations felt more like walking in the dense jungle and the humidity was crazy – but this is just what the banana plant loves. The flowers are something else, too – resembling triffids in my mind. Next we returned to the center to visit the workshop. 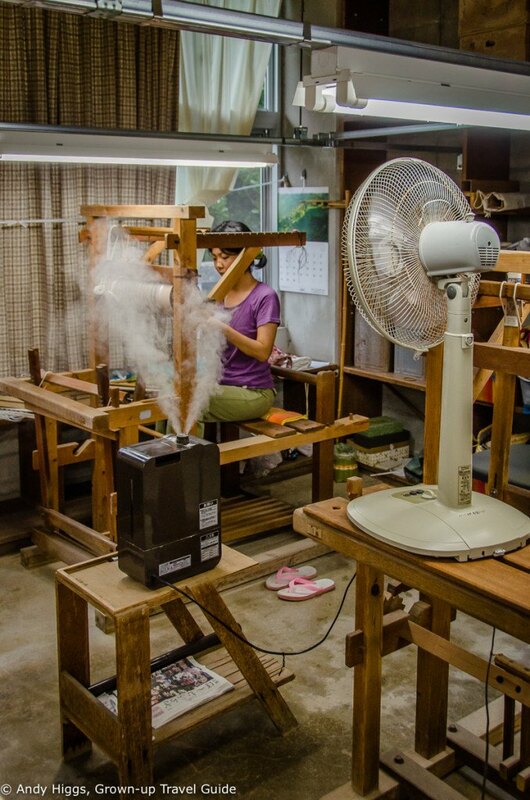 Heat and humidity are essential in the weaving process so we were covered in sweat in seconds. The same women take turns to harvest the plants and to weave, and I can only imagine they look forward to their time in the fields after hours working inside in these conditions. No artificial power is used in production – no electricity is required. 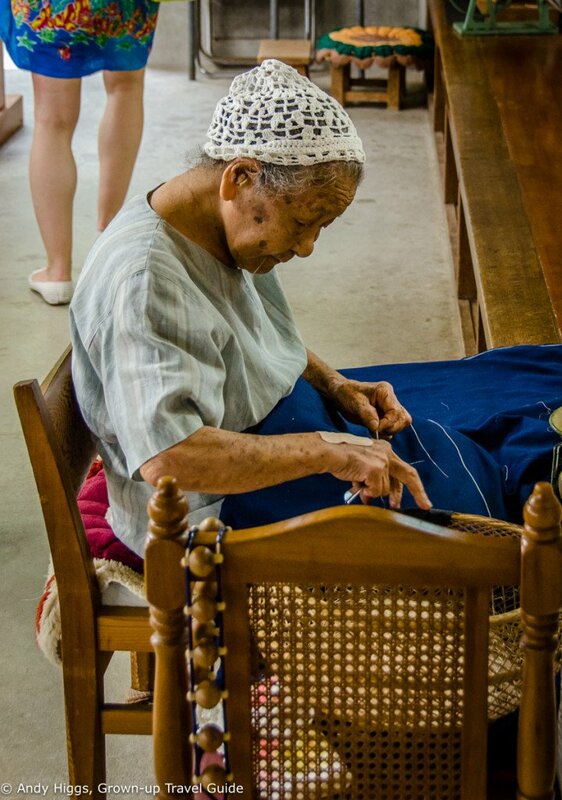 The entire process is made up of some 23 stages and a kimono ordered today will take the best part of a year to be complete – if there’s no waiting list. Prices are not cheap, but then how could they be for a year’s worth of labour? 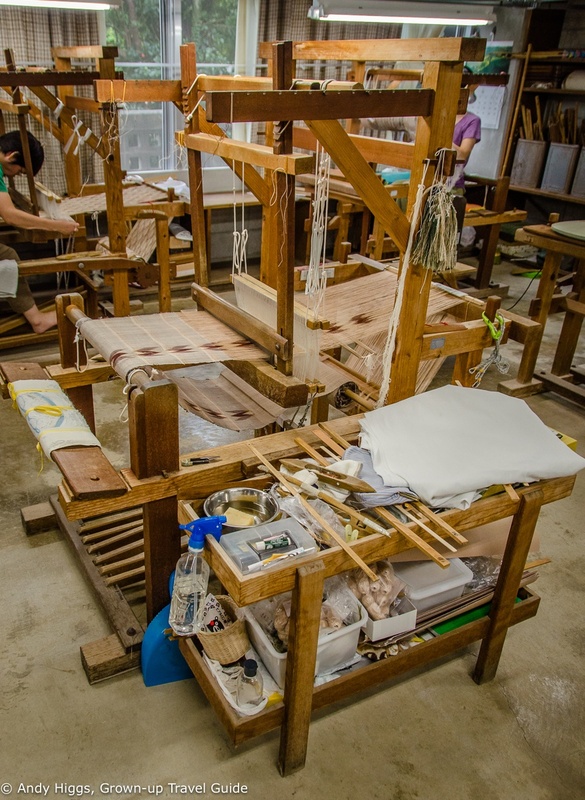 The finished product is an exquisite and unique garment that is often used as a wedding gift and cherished for life. 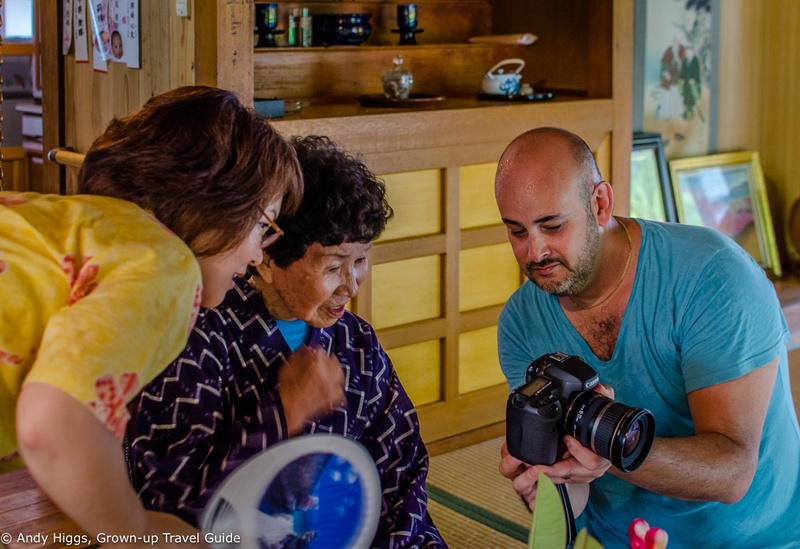 We were even lucky enough to get a glimpse of Toshiko Taira herself, still working though well into her nineties. The back office is suitably old-fashioned. Strands of fibre dyed with indigo stretched to dry outside the workshop. 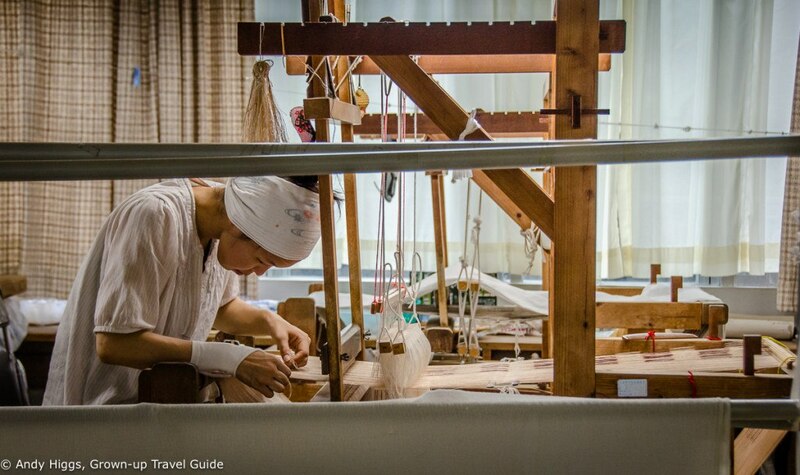 This is a fascinating place to visit and the skills employed in making bashofu are a little mind-boggling. 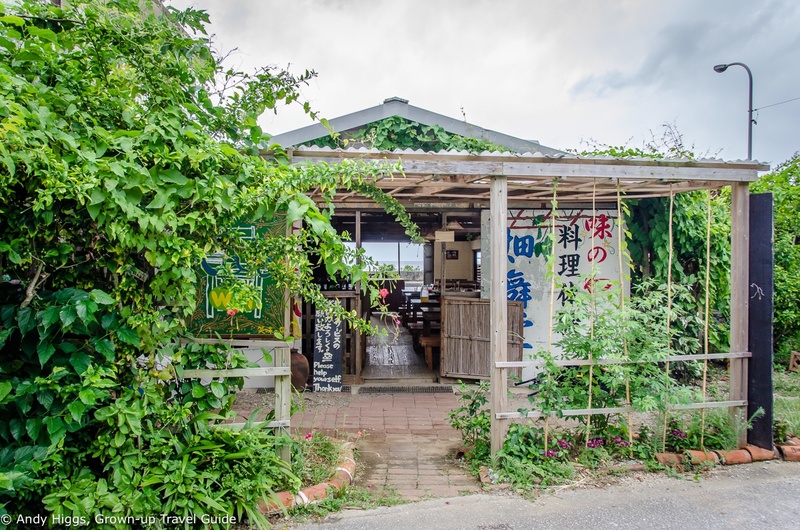 It is definitely worth your time and combines well with a trip to Ogimi Village. 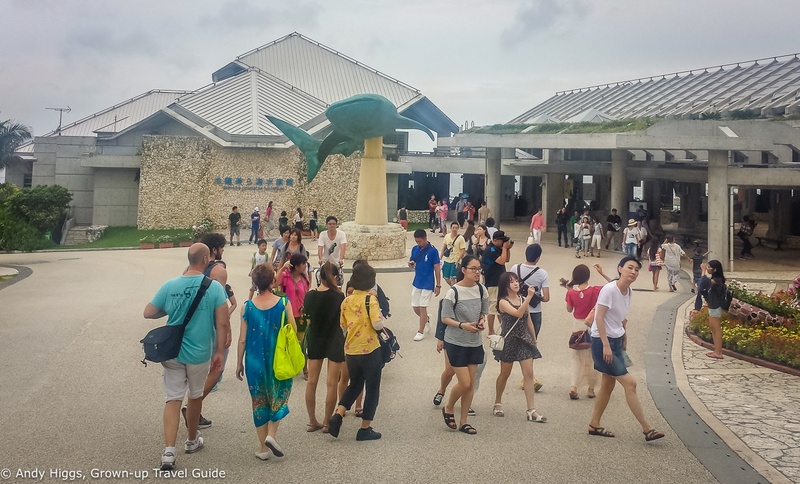 Next on our agenda was a visit to one of Okinawa’s most popular attractions – the enormous Churaumi aquarium. With a floor space of around 19,000 square metres and a main tank containing 7500 cubic metres of water, this is a place of superlatives. It’s also an aquarium, with all that implies. I’m a bit ambivalent to such places; I recognise there is an educational and scientific value to captive sea life but I just prefer to see such animals living free. 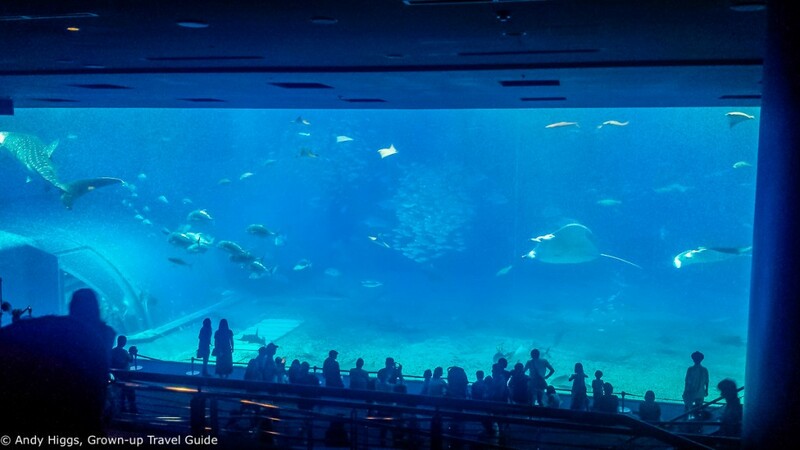 Also, if you’ve visited one major aquarium there’s little reasons to visit more – unless you have a specific interest in local fish for example. There’s no denying the main tank is impressive and the scale of the place is quite something. Our visit was brief and we were soon on our way again. 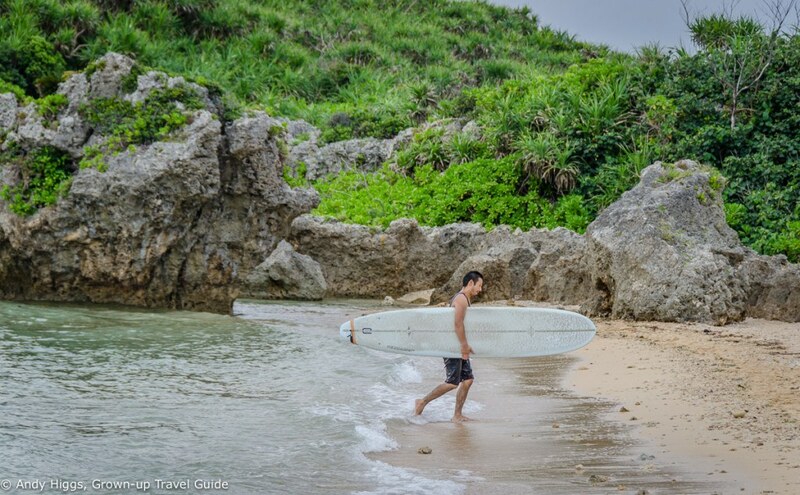 Surfing is very popular in Okinawa and we found people practising everywhere we stopped. The beaches are lovely here and basically there’s no development either – a nice combination. It’s easy to have this all to yourself – and the occasional surfer. 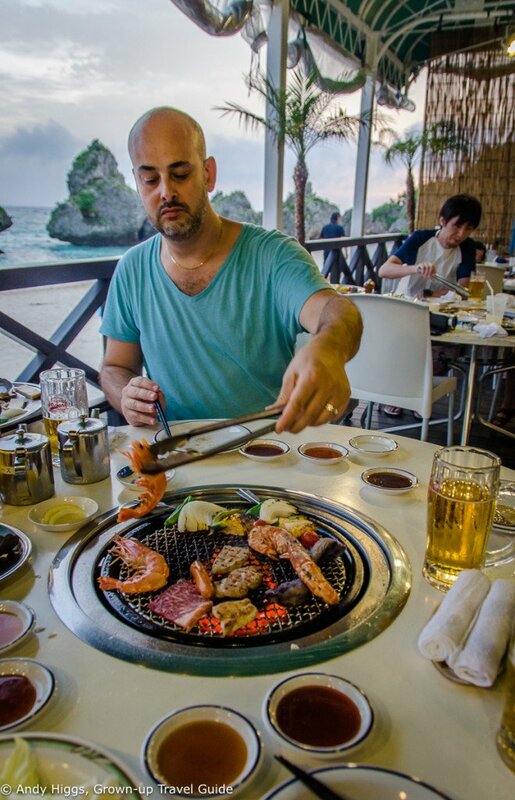 With a variety of seafood and meat on the menu it was fun to play chef for a change.